Q1: What is Input Service Distributor (ISD)? Ans: ISD means an office of the supplier of goods or services or both which receives tax invoices towards receipts of input services and issues a prescribed document for the purposes of distributing the credit of Central Tax (CGST), State Tax (SGST), Union Tax (UGST) or Integrated Tax (IGST) paid on the said services or both having same PAN as that of the ISD. Q2: What are the requirements for registration as ISD? Ans: An ISD is required to obtain a separate registration even though it may be separately registered. The threshold limit of registration is not applicable to ISD. The Registration of ISD under the existing regime would not be migrated in GST regime. All the existing ISDs will be required to obtain fresh registration under new regime in case they want to operate as an ISD. Q3: What are the documents for distribution of credit by ISD? Ans: The distribution of credit would be done through document especially designed for this purpose. The said document would contain the amount of input tax credit being distributed. Q4: Can an ISD distribute the input tax credit to all suppliers? Ans: No. The input tax creit of input services shall be distributed only amongst those registered person who have used the input services in the course or furtherance of business. Q5: It is not possible many a times to establish a one-to-one link between quantum of input services used in the course or furtherance of business by a supplier. In such situations, how distribution of ITC by te ISD is to be done? Ans: In such situations, distribution would be based on a formula. First, distribution would be done only amongst those recipients of input tax credit to whom the input service being distribute are attributable. Secondly, distribution would be done amongst the operational units only. Third, distribution would be done in the ratio of turnover in a State or Union Territory of the recipient during the period to the aggregate of all recipients to whom input services being distributed is attributable. Lastly, the credit distributed should not exceed the credit available for distribution. Q6: What does the turnover used for ISD Cover? Ans: The turnover for the purpose of ISD does not include any duty or tax levied under entry 84 of List I and entry 51 and 54 of List II of the Seventh Schedule to the Constitution. Q7: Is the ISD required to file return? Ans: Yes, ISD is required to file monthly return by 13th of the following month in Form GSTR - 6. Q8: Can a company have multiple ISD? Ans: Yes, different offices like marketing division, security division etc. may apply for separate ISD. Q9: What are the provisions for recovery of excess/ wrongly distributed credit by ISD? Ans: The excess/ wrongly distributed credit can be recovered from the recipients of credit along with interest by initiating action under Section 73 and 74. Q10: Whether CGST and IGST credit can be distributed by ISD as IGST credit to recipient located in different states? Ans: Yes, CGST Credit can be distributed as IGST and IGST credit can be distributed as CGST by an ISD for the recipients located in different States. Q11: Whether SGST / UTGST credit can be distributed as IGST credit by an ISD to recipients located in different States? 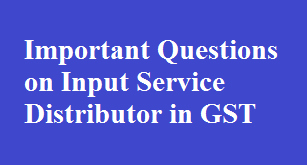 Ans: Yes, an ISD can distributed SGST/ UTGST credit as IGST for the recipients located in different states. Q12: Whether the ISD can distributed the CGST and IGST credit as CGST Credit? Ans: Yes, CGST and IGST credit can be distributed as CGST credit by an ISD for the recipient located in same state. Q13: Whether the SGST / UTGST and IGST credit can be distributed as SGST/ UTGST credit? Ans: Yes ISD can distribute CGST and SGST credit as SGST / UTGST credit for the recipient located in same state. Q14: How to distribute common credit among all the recipients of an ISD? Q15: Whether the excess credit distributed could be recovered from ISD by the Department? Ans: Excess credit distributed can be recovered along with interest only from the recipient and not ISD. The provision of Section 73 and 74 would be applicable for the recovery of credit. Q16: What are the consequences of credit distributed in contravention of the provisions of the Act? Ans: The credit distributed in contravention of provisions of Act could be recovered from the recipient to which it is distributed along with interest.